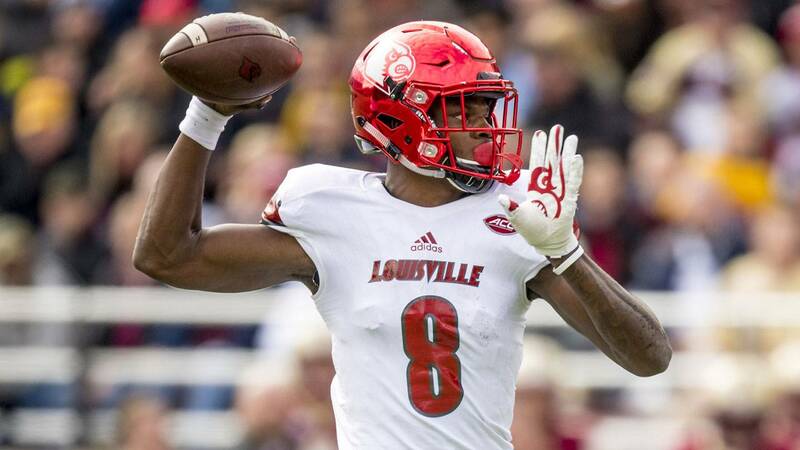 Louisville quarterback Lamar Jackson is headed to the NFL. The 2016 Heisman Trophy winner made his decision to enter the NFL draft official with a Twitter statement on Friday. "My time in Louisville has produced some of the best memories of my life,'' Jackson said in the statement. "I have had the pleasure of being in the presence of some of the best professors, coaches, advisers, training staff, athletes and fans in the nation. With their help, I have been able to grow not only as a quarterback, but as a teammate, student, and most of all, as a man. "After much discussion with my family and coaches, I have made the decision to take the next step in my career and enter the 2018 NFL draft." A Heisman finalist this year as well, Jackson passed for 3,660 yards and 27 touchdowns with 10 interceptions in his junior year. He also rushed for another 1,601 yards and 18 touchdowns. Both yardage totals top his stats from his Heisman-winning 2016 season. He finished his three-year Louisville career with 9,043 passing yards, 69 passing touchdowns, 4,132 rushing yards and 50 rushing touchdowns. Jackson's announcement comes two days after USC's Sam Darnold and UCLA's Josh Rosen, expected to be the top two quarterbacks selected, announced they were entering the draft.